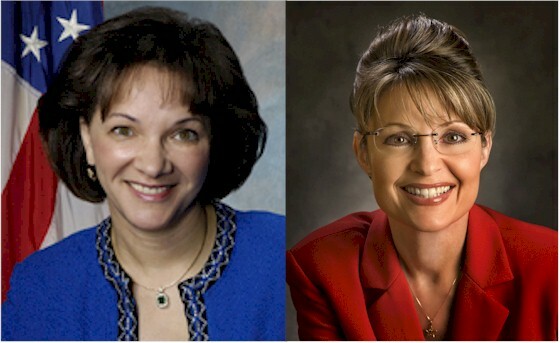 DorobekInsider: Doan-Palin — separated at birth? Needless to say, Lurita Doan is a controversial person. As most people know, she does a weekly column for Federal News Radio. This column about oversight was particularly controversial. Frankly, regardless of whether you like or dislike her, it makes for great radio because she’ll say things other people will not say. But Doan sent out the following e-mail that included this link that had a Doan-Palin separated at birth. A friend just sent this weblink (linking me to Palin) to my attention and I decided to forward it on to you. 1. Don’t attack the policy, attack the person. 2. Allege “corruption” of whatever action is taken regarding any procurement. 5. Crank up the bloggers and the media to spew the mud as thickly as possible. Quite comical really, but, then again it is effective. Gov. Palin, no doubt, has already gotten used to this…took me a while but eventually I did too. Have to admit that I rather admire Gov Palin, so if the bloggers and nutjobs want to cite similarities and suggest that we are separated at birth….well there is a lot worse that has been said about both of us. To be honest, I can understand how difficult it must be to be under the media spotlight. Frankly, we in the media — and the public at large — is quick to judge. And, frankly, we as the media don’t always get it right. And there is often more to the story. To be fair, it is often difficult to get ‘the rest of the story.’ That often becomes more clear over time, and by the time that picture becomes more clear, we’ve moved on. So I hear — and understand — her frustration. « DorobekInsider: Who’s going to be the acting Interior CIO?